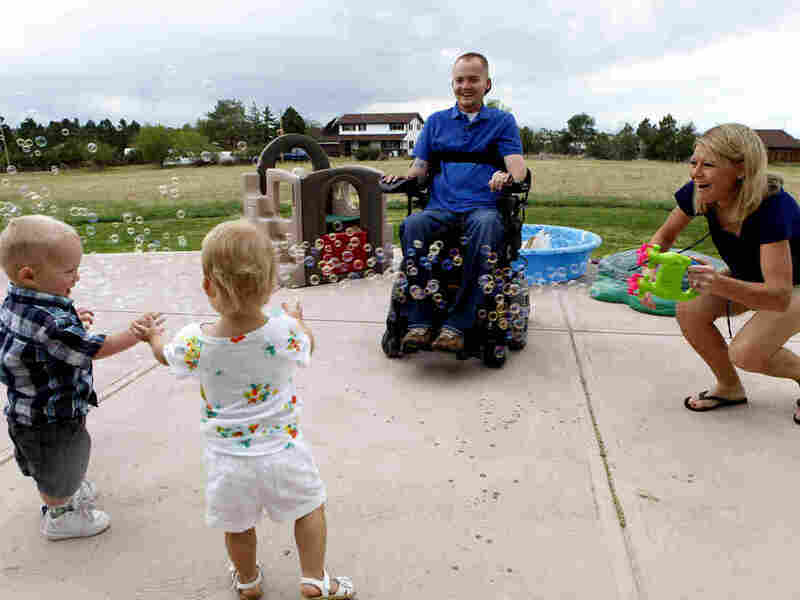 For Fertility Treatment, Wounded Veterans Have To Pay The Bill : Shots - Health News U.S. military health care covers the high cost of in vitro fertilization, but the Veterans Affairs health system doesn't. The discrepancy is putting vets with combat injuries in a bind. 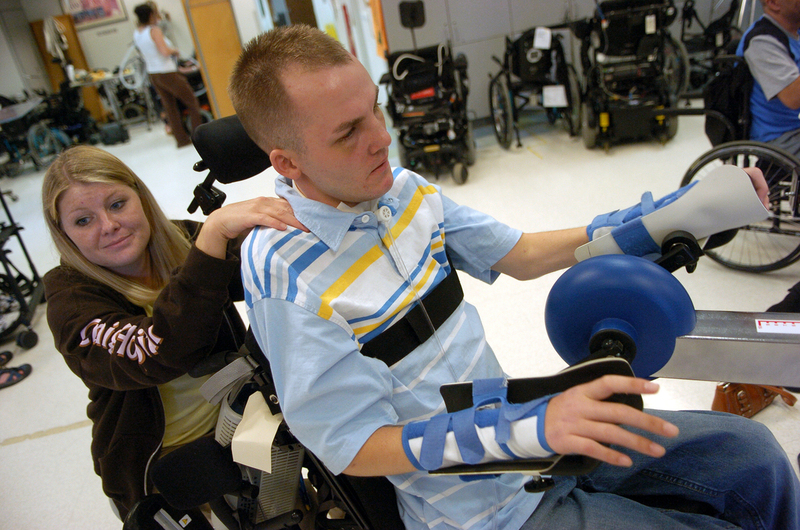 Matt Keil participates in physical therapy during a BeFit class at Craig Hospital in Englewood, Colo., in 2007. Midway through Matt Keil's second deployment in Iraq, he came home and married his fiancee, Tracy, in 2007. He had two weeks R&R; no time for a honeymoon. Before he went back to war the couple had the sort of conversation unique to newlyweds in the military. "I told her if you get a phone call that I'm injured, I'm probably fine," Matt says. "But if they come to the apartment or to your work in person, then I'm dead." Six weeks later the news came — a phone call, thankfully. Matt had been shot in the shoulder. It wasn't until Tracy got to Walter Reed Army Medical Center that she got the full story. The sniper's bullet had nicked Matt's spine. "The doctor came in and told me he was paralyzed from the neck down, and he said it was a 'Christopher Reeve'-type injury," says Tracy. Questions overwhelmed them about the future, including whether they'd ever be able to have children. It seemed like something they could figure out later. "They were kinda telling us we're putting the cart before the horse," Matt recalls. "You guys got to get through a whole hell of a lot of rehab." Time was running out, though, and the Keils didn't realize it. To have children they'd need help: in vitro fertilization. But IVF is expensive, costing, on average, at least $12,000 per cycle of treatment, according to the American Society for Reproductive Medicine. The Pentagon's health care system for active-duty troops covers IVF for wounded soldiers like Matt Keil. The Department of Veterans Affairs for veterans doesn't. By the time the Keils learned about the difference, it was too late. "We were just swallowing the fact that he was never going to go back to work," Tracy says. "But finding out that IVF wouldn't be covered because we agreed to retire out so quickly, that was hard, because nobody told me that." A law passed in 1992 made it illegal for the VA to pay for IVF, which some people oppose because embryos are often destroyed in the process. The only option for the Keils would have been to get the procedure done immediately after Matt's injury. They had missed the window. Matt was just starting to accept that with the limits of current science he might never walk again. But the limit on his ability to pay for IVF was put in his way by Congress. "This is a direct result of a combat injury," says Tracy. "Don't tell me that his service wasn't good enough for us to have a chance at a family. Because we've already lost so much. I just want to have a family with the man that I love and please don't make this any worse than it already has to be." In the decades since Congress banned IVF for the VA, the procedure has become much more common. And about 1,400 troops came back from Iraq and Afghanistan with severe injuries to their reproductive organs. Thousands more have head injuries, paralysis or other conditions that make IVF their best option. Bills to change the law come up periodically, only to be blocked at the last minute, says Sen. Patty Murray, a Democrat from Washington. "They don't come out and say that directly, but there continues to be a backroom concern about the practice of IVF," Murray says. Murray's bipartisan IVF bill nearly passed last summer. Republican Sen. Thom Tillis of North Carolina, who is staunchly against abortion rights, effectively blocked it. Tillis declined requests for comment, but said at the time that he opposed the bill because other problems at the VA need to be fixed first. The Congressional Budget Office estimates a change in VA policy to pay for fertility treatment could cost more than $500 million over four years. Murray says vets should get the same options as active-duty troops. "It's really ridiculous that Congress would deny a widely used medical procedure to our veterans just because of their own ... beliefs," she says. Rep. Jeff Miller, the Republican chairman of the House Committee on Veterans' Affairs, said he's working toward a compromise that "meets the needs of this special group of severely injured veterans while being sensitive to concerns surrounding IVF procedures." In the meantime, many fertility clinics across the country offer discounted rates for veterans who are paying out of their own pockets for IVF. For the Keils, who spent the year after Matt's injury figuring out how their new life could work, offers like that came too late. "We weren't at a good spot in our marriage at the time, and thought that if we're going to bring kids into this world they need to be brought into a healthy relationship," says Matt. "What if we didn't even end up staying together?" Tracy adds. They took a year to work it out, and then decided it was for sure — their marriage would survive. They also wanted a family. "We were ready, and it didn't matter what it was going to take," Tracy says. The VA told them what they already knew — no coverage for IVF. The decision still seemed crazy to them, considering how much medical care VA would pay for. "I served my country. I was injured," Matt says. "All my medical supplies are paid for, but the one thing they won't facilitate [by] paying — that I lost the ability to have — was a family." Paying for IVF on their own seemed impossible to Matt and Tracy. The Keils play with their twins, Matthew and Faith, at their home near Parker, Colo., in 2012. Matt's condition meant that IVF would be even more of a financial strain than usual. Among other things, Tracy was her husband's full-time caregiver, and they would need to hire help while she was getting treatments. Their savings weren't going to cut it. But then a veterans charity paid for the Keils' wheelchair accessible house, so they could target their money toward IVF. The local VFW held a fundraiser to help. Kids all around Denver and then Colorado set up lemonade stands and collected donations, too. The couple's twins, Faith and Matthew, were born in November 2010. They ride on the back of their dad's motorized wheelchair. When he wants to lift them high in the air they jump on his feet and he reclines the chair until he's upside down. This winter the kids are outside building igloos and snowmen. Thousands of vets have injuries that make IVF their only option for having a family. Matt and Tracy Keil say they want them all to get that chance. In the audio of this story, we say that military health care for active troops covers the costs of in vitro fertilization. But the costs are only covered for active-duty troops who suffer combat injuries and need IVF in order to conceive a child. We should have said, as is written in our Shots post, that "the Pentagon's health care system for active-duty troops covers IVF for wounded soldiers like Matt Keil."